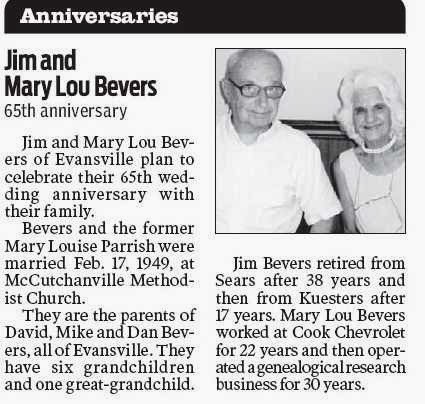 Jim & Mary Lou Bevers!!! Mary Lou has served in many different offices and committees including the Annual TSGS Seminars Chairperson. She has served on the society's Board of Directors for many years. Mary Lou has presented numerous programs and workshops... always emphasizing the importance of citing sources for your family history. She has contributed significant articles to the Eastman's Online Genealogy Newsletter and she has been very active for many years with the Indiana Historical & Genealogical Society. Jim has always helped with the TSGS events with May Lou helping everyone become a better family historian. Over my 35 years involvement with TSGS, I believe that Mary Lou has helped me the most of any other TSGS member! For several years Mary Lou helped judge the Vanderburgh County 4-H Fair notebook exhibits. Anyone making it to their 50th. wedding anniversary has a lot to celebrate, but this couple has reached 65 years of marriage... that is a major achievement! TSGS is very happy for the two of you and we wish you a very special anniversary celebration! I have know Jim and Mary Lou for many years. Mary Lou was very instrumental in helping to trace my ancestry back to the Revolutionary War making me elgible for the Sons of the American Revolution. I also knew them from New Bethel Baptist Church. Congratulation to both of you for 65 years of marriage.